While the lamb’s lettuce consumption is booming, the growing of this sensitive product requires a specific technique including shading protection if you do want to succeed. Specialized in lamb’s lettuce, young shoots of salad and radishes within the Nantes Area since 1973, The SCEA Vendéa company has this know-how. Nantes Area (France) represent 50% of European lamb’s lettuce production. The Nantes area represents 85% of lamb’s lettuce national production and 50% of European production. Each year, about 6,000 hectares are devoted to it. 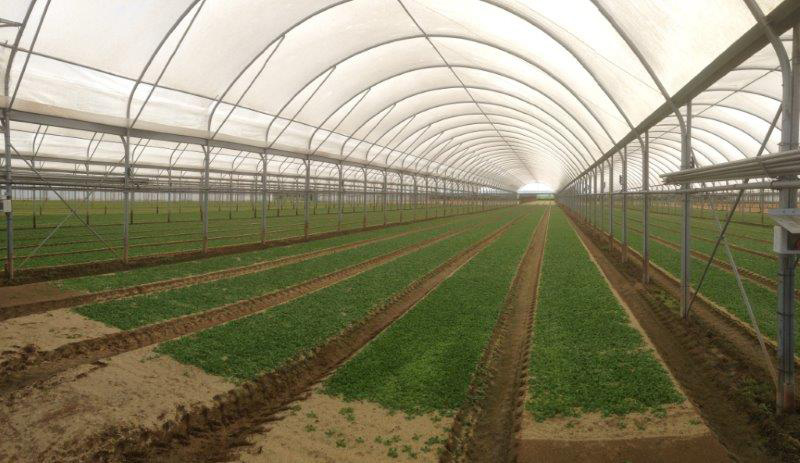 In winter, the production is done in full field, under small plastic tunnels also known as “Nantes caterpillars.” In summer, the production is made under large plastic greenhouses that allow better climate control with lower insect pressure. Sudlac Eclipse LD² shading recommended for lamb’s lettuce crops. The Departmental Committee for Vegetable growing Development of the Loire-Atlantique French region (CDDM) provides technical support to vegetable producers from the Nantes Area. During a two-year study (2015 and 2016), they’ve been testing different Shading solutions on large plastic greenhouses for shading rate, resistance, and application. They concluded Eclipse LD² from Sudlac is the best product and they do recommend to get 50% of shading at the first application early in the season and then increase to 60-65% of shading at the second layer for lamb’s lettuce growers.